It is well understood that AMD Bulldozer is designed for the enterprise. Its 16-cores are like the big guns of the battleship which (unlike the single shot Remington rifle) deliver a heavy payload. Indeed, when it comes to mission critical enterprise applications, the Bulldozer simply destroys Intel Xeon. We are not talking about the Cinebench and SuperPI that AnandTech is good at, but TPC-C, SPEC JBB2005, SAP ERP, etc, for the commercial enterprise of the capitalist world. AMD beats Intel by such a big percentage, it opens a performance gap that Intel will struggle to overcome. First, SAP Enterprise Resource Planning. The Opteron 6200 achieves 31720 SAPS. The Xeon X5690 struggles for 28480 SAPS. The Opteron achieves 5805 users and the Xeon X5690 handles 5220.The Opteron is indisputably 10% faster. Second, TPC-C -- Transaction Processing Performance Council Online Transaction Processing. An HP DL385 armed with 2x AMD Opteron 6200 system achieves 1.208 million tpmC, while an HP DL380 with 2x Xeon X5690 gets 1.024m tpmC. The Bulldozer Opteron bulldozed Xeon X5690 by a healthy 18%. Some lesser educated writers say the AMD server is 18% faster, but 33.8% more expensive ($0.87 for the Opteron system vs $0.65 per tmpC for Xeon ). These lesser educated writers fail to notice that the price difference is due to the fact that the AMD system can handle and has more storage. The AMD system has 90 big SSDs, costing 1.124 million USD. The Intel Xeon system has fewer SSD drives costing $0.485 million USD. That alone is a $639,000. cost difference. If you put the same number of SSDs into the Xeon system, it would cost $1.3 million, resulting in a $1.27/tmpC price/performance. In other words, an equally populated Xeon system is 18% slower and 46% more expensive than the Opteron in transaction processing. 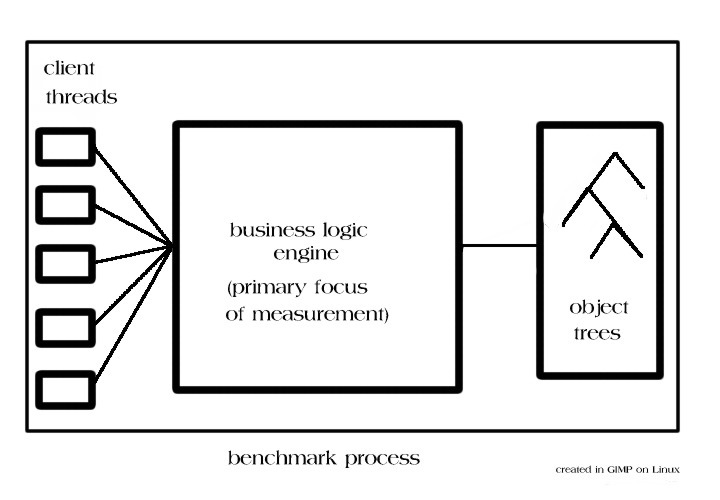 Third, SPEC JBB2005 -- Enterprise Java Server Benchmark. This benchmark runs a 3-tier enterprise environment. 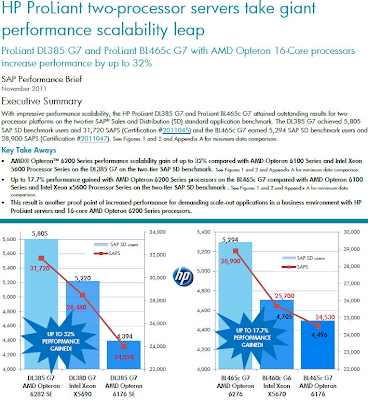 The 2p Opteron 6200 system scores 1.254 million bops. The 2p Xeon X5690 does 0.9753 million bops. The Bulldozer Opteron smashes Xeon X5690 by 28.6%. When we go to 4p, the Opteron 6200 scales almost linearly, attaining 2.427 million bops. These results are consistent with our previous observation that the Opteron 6200 is 30% faster than the Xeon X5690 in integer performance gauged by SpecInt2006_rate. Clearly, Bulldozer has an inherent advantage over Xeon. Some users noted that even on desktop, when you don't use applications specifically optimized for Intel, the Bulldozer wins. How do Intelers argue against these hard numbers? Some of them say the Xeon X5690 is a four-year old obsolete chip, so the comparison to the all new Bulldozer is unfair again. Well, I tend to agree. Why stuck with old generation technology when you can have the younger, higher performing and less costly Bulldozer? Agree? Some readers complain that I was quoting AMD's press release on Bulldozer Opteron's towering performance numbers. Now, the numbers have been validated and published on Spec.org. Let's have a look at the highest scores for the Bulldozer. In SpecFp2006_rate, a 2P Bulldozer Opteron server achieves a score of 403. Simply put, there is no 2P Xeon can match this score. In SpecInt2006_rate, a 2P Bulldozer gets a score of 543. This is almost 30% higher than a 2P Xeon X5690. Some readers say it's not fair to compare the 16-core Opteron to the 6-core/12 thread Xeon. They missed the whole point of measuring performance per watt. The 6-core Xeon consumes 130watts. The 16-core Opteron consumes the same amount of power. With more cores, the Opteron can simply do more within the same thermal footprint. How will Intelers argue against these hard numbers? They resort to the usual low IQ, low education ad hominem attacks. Just read their comments on my blog, and see how low they are. 2x AMD Opteron™ processors Model 6282 SE (2.6GHz): SPECint®_rate score= 526. 2 x Intel Xeon processors Model X5690 (3.46GHz, 130watt) : SPECint®_rate score = 421. Not surprisingly, the Bulldozer Opteron destroys Intel Xeon in other enterprise benchmarks, in some cases, 89% faster than the popular Xeons. 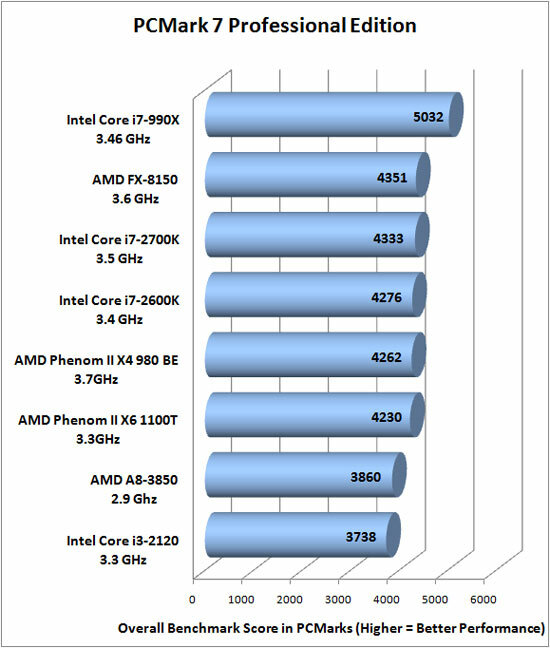 In PCMark 7 Professional Edition, AMD's Bulldozer FX 810 clearly beats Intel i7-2700K.